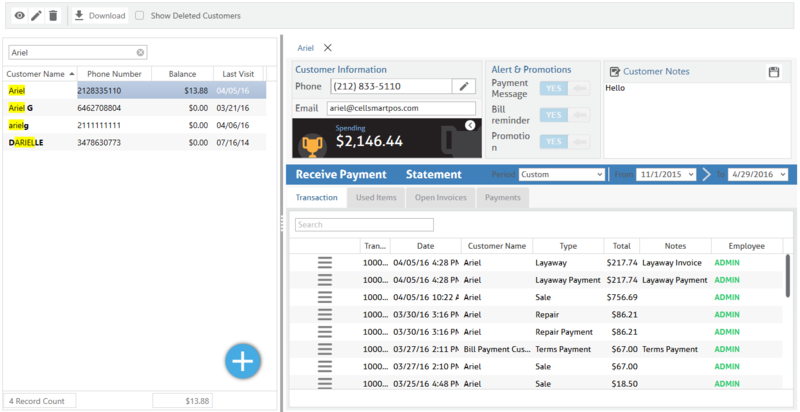 The List of Customer allows you to view, edit and delete your customers from the software. You are able to receive account payments, view statements, view transactions, used items sold by the customer, open invoices, and view payments. Spending: How much the customer has spent in your store. Store credit: How much store credit the customer has. Accounts: How much the customer has in his account in the software. Points: How much points the customer made by coming to your store which can be used to motivate customers. You can receive payments from customers into their accounts through the list tab. For example, if a customer chooses to select accounts as their payment method while checking out, they are adding balance towards their account which they will have to pay eventually. The Receive payment option allows you to receive payments from customers that are due. In other words, they are paying the bills that are due and we are receiving them. When receiving the payments, all the invoices that were created using accounts as the payment method will show up, and you will be asked to select the invoice for which the customer is paying money for. Then, click on the Customer icon. Select your customer from the customer list by double clicking on it. Once the customer's information window appears on the right side you may click on the receive payment option to receive a payment. Select the invoice that you are receiving the money for from the invoice list. Select your payment method and click save and the customer's term receipt will be printed. You can view your customer's statement which will show you the details of all the transactions related to the customer. For example, you can view all the sales associated with the customer and the products that were sold with their details. Once the customer's information window appears on the right side you may click on the statement option and the statement will be generated. Once the customer's information window appears on the right side you may click on the Transaction tab and all the transactions associated with the customer will be listed. Once the customer's information window appears on the right side you may click on the Used Items tab and all the used items that you purchased from the customer will be displayed. Once the customer's information window appears on the right side you may click on the Open invoices tab and all the open invoices related to the customer will be displayed. Once the customer's information window appears on the right side you may click on the payments tab and all the payments that the customer made for any transaction will be displayed.